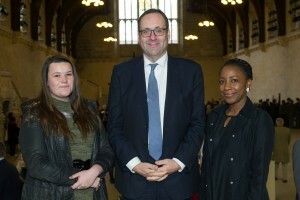 On 8th March 2016, in celebration of International Women’s Day 2016, Richard Harrington, MP for Watford, invited two Watford girls to shadow him in Parliament. Samantha Sibanda was chosen by her teachers at Francis Combe and Sophie Richards was chosen from Watford UTC. The young ladies took part in a workshop to discuss how to get to a 50:50 gender balanced Parliament. After this they took part in #takeovertuesday which meant that the girls took the place of members of the Women and Equalities Select Committee, a group of MPs chaired by Maria Miller, who are elected to scrutinise the work of the Minister for Women and Equalities. Samantha’s name and school were written on the official Order Paper for the Commons. Samantha was selected to sit on the committee for the session to ask her question: “Do you think that integration is an issue in our society? If so what are the policies you have in place to tackle this?”. The girls then had lunch with Richard Harrington, MP for Watford, in a Commons restaurant, discussing the significance of International Women’s Day, discrimination in the workplace and the girls’ plans for the future. After lunch both girls went on tour of 10 Downing Street and then back to Parliament to watch the International Women’s Day debate in the Commons. Examination Timetables Summer 2016 Now Online! 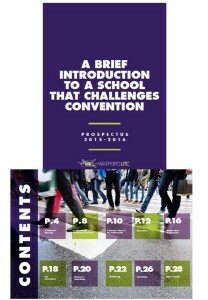 Information Events – thinking of joining us in 2016? 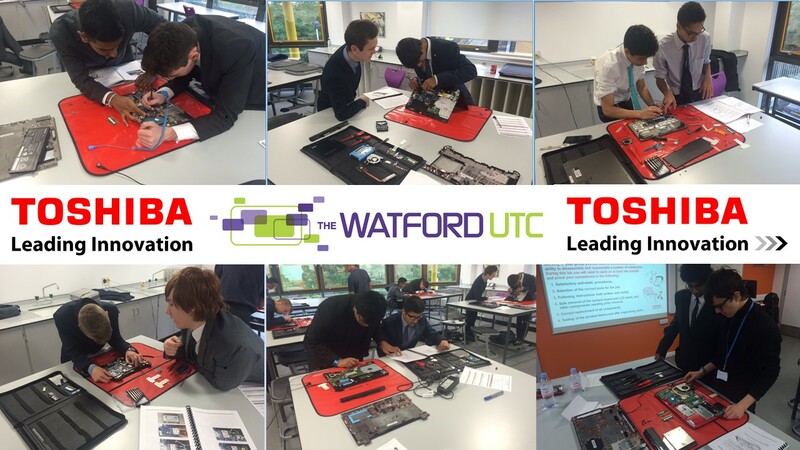 Information Events – find out more about Watford UTC if you are thinking of joining us in 2016! Thank you to Seb Alfano, Daniella Bernard, Clare, Anna and everyone at Elstree for putting this wonderful video together. The Elstree UTC offers full-time technically orientated courses to students aged 14-19, specialising in the entertainments industries. Students work with Elstree UTC Productions on live industry projects building up valuable skills. This video was part filmed by a group of Year 10 and 11 students and edited by Seb, a final year student. The music was written especially for this video by Daniella. And thank you also to our Team Margot Ambassadors: author of Margot’s favourite Blue Kangaroo books Emma Chichester Clark, comedian Lee Nelson and TV Dr & author Ellie Cannon for all your support. In 2013, 14-month-old Margot Martini was diagnosed with blood cancer and required a bone marrow transplant (also known as a stem cell transplant) to stand the best chance of survival. Margot eventually found a suitable donor match and received her bone marrow transplant in February 2014. Unfortunately, Margot’s Leukaemia was extremely rare & aggressive. She relapsed during that summer and passed away, aged 2 years and 2 months, on the 27 October 2014. Team Margot launched Margot’s donor appeal on Christmas Eve 2013 and are credited as having run the most high profile global donor appeal anywhere in the world, embracing national and international TV, radio, print, online, outdoor media and Virgin America flights. Within the first 6 weeks of launch the charity, Delete Blood Cancer UK received over 50,000 requests for swab kits in the UK alone. Our initial goal: 2.2 million people on the UK stem cell register. There are only 1 million people currently registered (1.6% of the population). To find out how quick and easy it is to register, please visit teammargot.com – wherever you are in the world, YOU can save a life. We continue to honour Margot’s legacy as a permanent Foundation. Latest Batch of Toshiba Self Maintainers Qualified! Student Reflection Surgeries are opportunities for the families of our Watford UTC students to see what they have achieved so far this academic year. It is also a time for students to reflect on what worked well (www) and how their progress could be even better if (ebi) targets are set and met. It also a chance to mingle with staff who will be around to support the event. Emma & Paul will also be presenting an update to parents prior to your appointments. Click the link below to book your place on our first Student Reflection Surgery of the academic year. There are three timeslots available.